I sometimes feel that it's possible to go a little over board when it comes to hair care, and while I do agree that hair is hard to maintain; weather your trying to grow it out or just keep it healthy. I feel I have the secret to keeping my hair healthy. Minimal styling, Minimal colouring, Minimal Products. I really can't stress enough just how little I actually do with my hair. I wash my hair every 3-4 days with what ever shampoo and Coniditioner I'm loving at that moment. 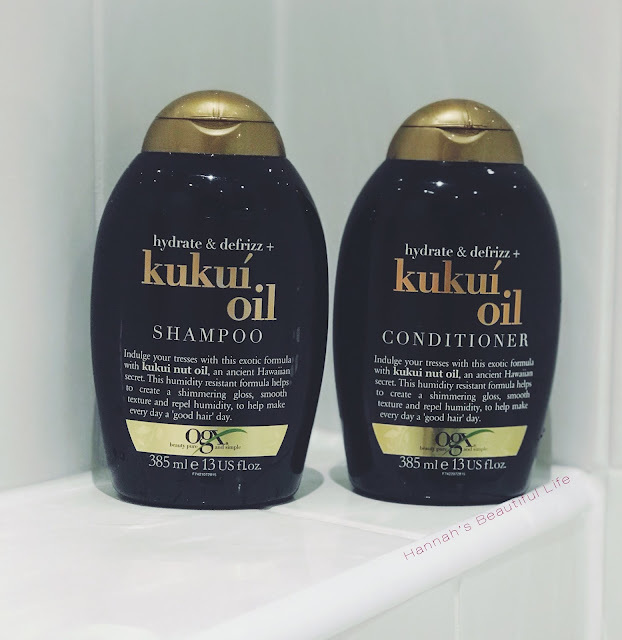 I recently found my love again for OGX KuKui Oil, the scent reminds me of summer holidays as it's quite coconuty and it feels very luxurious on your hair. I make sure I have time to leave the conditioner in my hair for a good 5-10 mins before I wash it out and when I do I rise with cool water as this helps to seal in the moisture! I don't do this every time but 7/10 times I do, but I can notice the difference in my hair when I don't. I just not quite as shinny or sleek with out a quick cool wash.
Once my hair is squeaky clean I will use my OGX Argon Oil, this stuff is my all time holy grail hair care product. I can change up my shampoo and conditioner as much as I like ( I do yes still have my favourites) but this is just not up for discussion... If you love hair oils, but haven't tried this I cant't recommend it enough. I've only ever seen it in boots or Superdrug and it usually prices at £8.00 but I some times find at more or less... No idea why. But I don't mind buying it at a higher price, as it's well worth the money and the little bottle can keep me going for absolutely months! I know I'm probably one of the lucky ones, my hair is naturally straight so I don't have to spend hours straightening it. If I want to do something different with my hair I usually put it in plaits and then go to bed, wake up in the morning and take them out leaving me with waves and hair that actually has a little volume for a change. Or if I want curly hair I use my little sock doughnuts.. ( sounds strange I know, but it actually works) I remove these in the morning after checking that my hair is completely dry first. My hair struggles to hold any style, so if tis still damp then the curls just fall straight out. And that's just a waste of time and effort then isn't it!? I much prefer to use these heat free styling tactics and I think my hair really thanks me for them too. What are your holy grail Hair Care products?